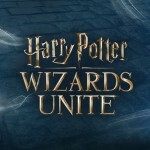 One of the aspects of the Harry Potter series that strikes a chord with so many fans is the reflection of the story on their own school experience. 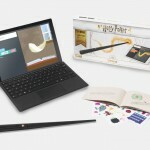 No, none of us, (as far as we know) has attended a school of Witchcraft and Wizardry; but the life of a student is certainly a common denominator for the majority of the fandom. And when we think back on those formidable years, aside from making friends, discovering our talents, and cramming for exams, it’s the teachers, whether remembered as tutor or tyrant, who we revisit time and again in our Pensieve. Since 1985, schools across the U.S. have deemed the first full week in May Teacher Appreciation Week. After nine months of spending more time in class than at home, students and families have the opportunity to thank these dedicated purveyors of knowledge, who may in some cases, play the role of proxy parent throughout the school year. Though none of us are actually Hogwarts-educated (though we may feign it on occasion), Leaky has spent this week honoring those professors who go above the call of duty managing students 24/7. 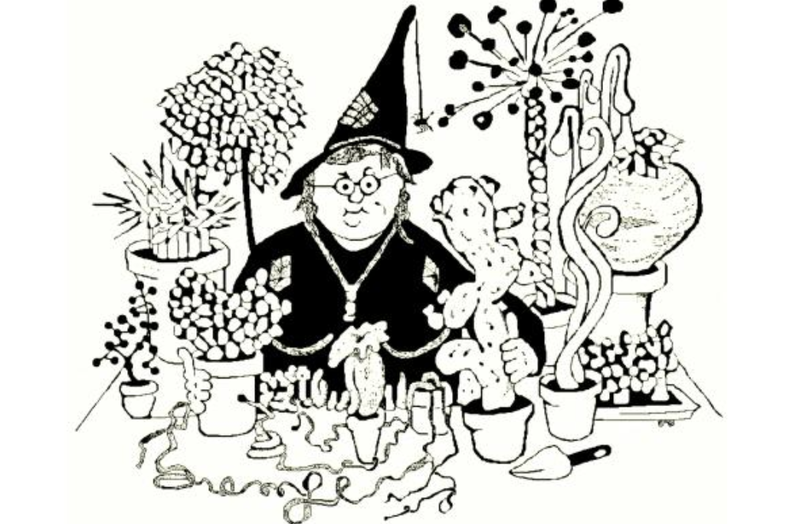 This Muggle is a card-carrying Hufflepuff, so today we pay a grassroots tribute to Hogwarts Herbology teacher and Head of Hufflepuff House, Professor Pomona Sprout. Do you remember the time spent learning from your science teachers? These sages of scientific theory often brought a distinctively different energy to the classroom than did those who taught humanities or the arts. The experience of this Leaky editor was that they were rarely afraid to get their hands dirty and honestly, pretty comfortable leaving them that way. They taught us to dig in; literally and figuratively, without fear or hesitation, employing their knowledge and knack for the subject matter as our tour guide through familiar yet completely unexplored territory. And these pioneers of the physical world were as excited to introduce you to this new stuff as they were to see it themselves. Throughout Harry Potter, Pomona Sprout fits this description to a tee; her tattered patched hat as prominent as the Hufflepuff trademarks of loyalty, patience and hard work she demonstrates for her pupils as well as her plants. We didn’t see much of Professor Sprout in book one, but we know she was proficient enough in her discipline to be recruited by Dumbledore to assist in thwarting Voldemort’s quest for the Philosopher’s Stone. Being a team player, as well as an adversary of the Dark Lord, she filled the first of the underground chambers with Devil’s Snare, one of the many magical botanicals she shares with her students through the years. And talk about getting her hands dirty, this master gardener didn’t hesitate for an instant to bandage the Whomping Willow after Ron and Harry landed the Anglia right in its limbs. That wouldn’t have been a pleasant job for anyone, but Professor Sprout was up to the task. 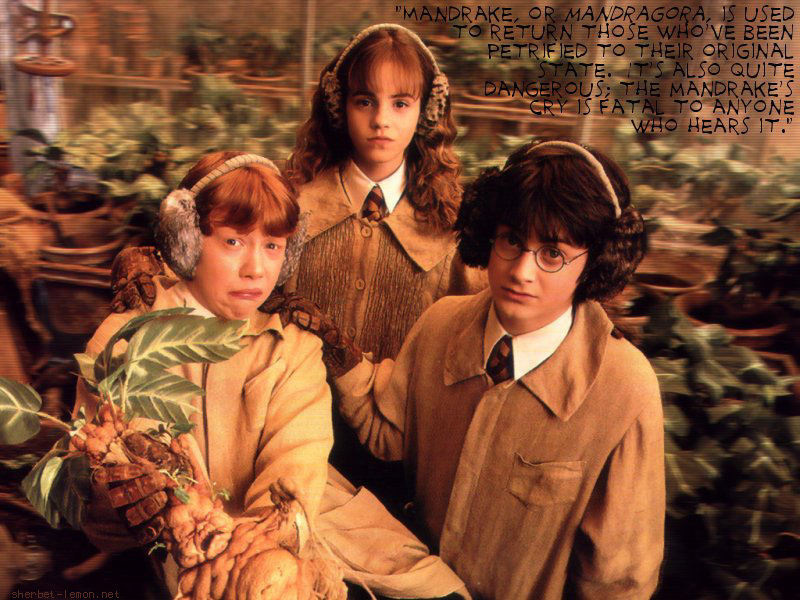 It’s possible that Hermione may not have made it to book three if it wasn’t for Professor Sprout’s patience and expertise. Those Mandrakes were certainly not for the faint of heart, and she handles them with ease, from new growth to grown siren. You’d think, being a Hufflepuff, she may have become quite attached to these screaming shrubs as they matured, but her devotion to the school and it’s students took precedence and allowed her to chop up those suckers for the draught that would restore the Basilisk’s victims to normal. Is there anyone aside from Pomona Sprout who would be enthusiastic about Bubotuber Pus? We can’t even say the word without getting a little squeamish. 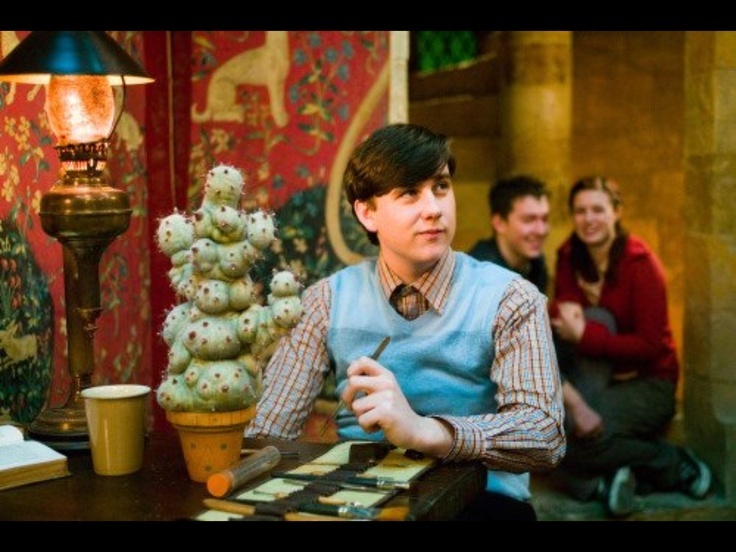 In Goblet of Fire, Sprout conveyed her Tuber prowess with Harry and friends as well as cultivated enough of the gunk to rid the teenage wizard population of their acne. Later that year we would see how her Hufflepuff heart translated to the care of humans when she took it upon herself to deliver the devastating news of Cedric Diggory’s death to his parents after the Triwizard Tournament. Sprout kept her calm demeanor during Umbridge’s rule at Hogwarts, managing to demonstrate her competence and keep her position throughout the High Inquisitor’s evaluation. She detested the pink clad witch as much as the rest of the staff, and gave a consistent green thumbs up to the students during Umbridge’s reign. Her loyalty towards Dumbledore was evident upon his return to Hogwarts and was highlighted the following year when she opposed closing the school after Dumbledore’s untimely death as well as supported letting the students attend Dumbledore’s funeral. 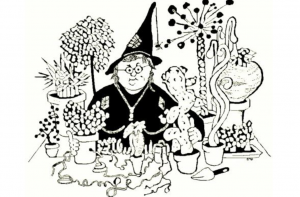 J.K. Rowling makes sure to tell us that Professor Sprout exchanged her dusty everyday robes and patchwork hat, for spotless attire worthy of the Headmaster’s memorial. 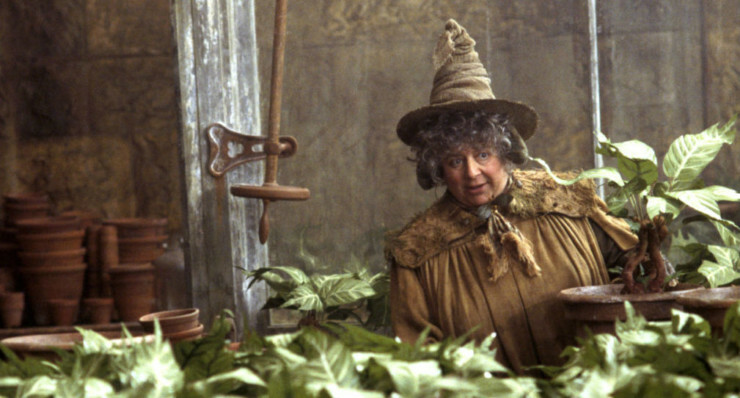 Professor Sprout may have made the greatest impact on Hogwarts through her influence on one particular student. Under her tutelage, Neville found a passion he could carry on to adulthood. She helped him sufficiently hone his skills to one day take her place as Hogwarts Herbology Professor. She was indeed a true mentor. They come few and far between and are exactly the kind of teachers deserving of appreciation this week. “I drew this picture on December 30, 1990, and I can be very precise,” the acclaimed writer shared. “I was staying at a friend’s house and I had been writing Potter for six months and I stayed up when everyone else had gone to bed because I was watching the film, The Man Who Would Be King.” She added: “The reason I can be incredibly precise about when I drew this was because at some point during watching that movie and drawing this picture, my mother died, 250 miles away, and I got the phone call the next day to say she had died.” JK Rowling also described the character as the “most maternal or parental” of the four heads of houses at Hogwarts. Pomona Sprout, who not only personifies the traits of a Hufflepuff, but also has this personal connection to J.K. Rowling, may just well be one of the most undervalued of all the Hogwarts Professors. 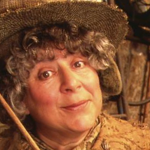 Badgers, raise a trowel to your Head of House, Professor Sprout, for Teacher Appreciation Week, and do something special for the teachers in your life today!